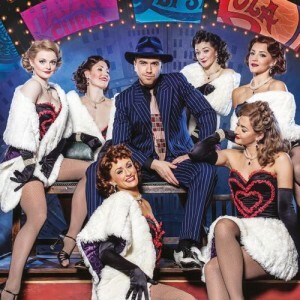 Guys and Dolls is a post-WWII musical comedy set in bustling New York City, and primarily tracks 2 parallel stories. Nathan Detroit is your typical New York gangster and is desperately trying to find a venue to host his next crap game, away from the prying eyes of the cops and his long suffering girlfriend Miss Adelaide. Fellow gambler Sky Masterson will bet on almost anything, so when the opportunity to corrupt local salvation worker Sarah Brown presents itself he rises to the challenge. As the plot unravels you find out who really comes up best in this game of chance. The show is superbly cast and the four principal actors, Dearman, Fleeshman, Caulfield and O'Byrne control the stage with ease.Dearman shines as Nathan's frustrated counterpart, Miss Adelaide and provides comedic value throughout. A particular highlight is her rendition of 'Alelaide's Lament', which expresses her feelings about being an unmarried female. Fleeshman has everything needed to give an excellent portrayal of the suave and handsome Masterson. Beaming with confidence and vocally on point, particularly during the the Sinatra classic, 'Luck be a Lady'. Carlos Acosta's slick choreography is on point throughout and really contributes to the polished feel that this production has. The show does tread a thin line between being classic and dated though, with some of the gags failing to provoke audience response. The comedy is gentle but the cast alone are well worth the ticket price.